Let’s face it, the 3 Series is the most important Series for BMW. For 40 years, the 3 Series has been the market leader, the car most competitors copy and, for much of that 40 years, has accounted for over half of BMW sales. There have been over 15 million 3 Series sold to date. With the proliferation of models, particularly Sports Activity Vehicles from X1 to X7, the 3 Series no longer makes up over 50 percent of BMW sales. But it is still the architype of the BMW breed. A new BMW 3 Series is a big deal. In October, BMW introduced the seventh generation of the 3 Series, the G20. We’ll see it starting in spring 2019 and many of you will buy one. It will, of course, be the 3 Series, with many variations on the theme in terms of body styles, drivetrains, trim and options. Every 3 Series has been successful. In fact, it has remained the world’s best-selling premium car. BMW’s success as a company has been largely due to selling the 3 Series at premium prices in volumes usually associated with mass market cars. The outgoing 3 Series is the F30/F31/F34, which has been with us since 2011. While an excellent car, particularly in M guise, the outgoing car has been criticized for being a bit soft and having steering lacking in feel. 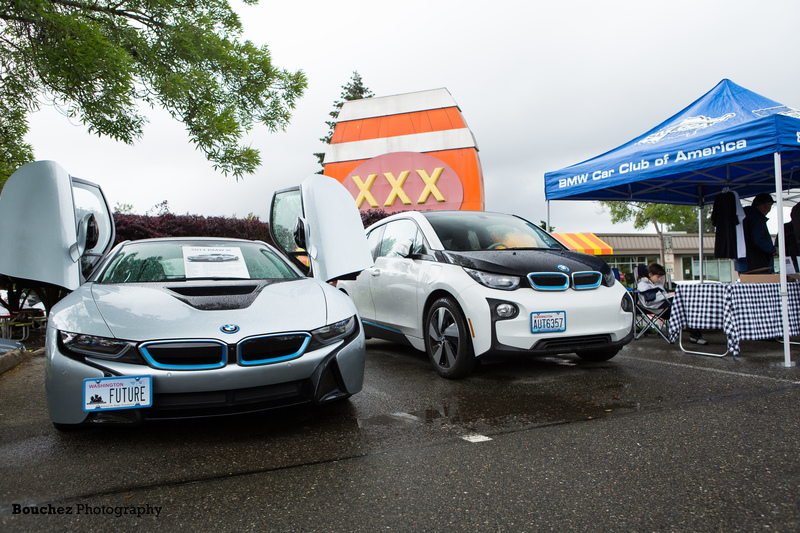 Other niggles have led to the competitors catching up with BMW. In fact, it is no longer common for the 3 Series to win comparison tests run by the various print and online magazines. BMW has heard the complaints and whining. The G20 is meant to put the universe back on its proper axis. The first evaluation I’ve read from an independent source was Car magazine from England, generally thought to be the best car magazine in the world. They titled their article BMW’s ‘Perfect’ 3 Series. I’ve never seen nor heard of a perfect car, but evidently the new 3er comes close. The looks of the car won’t confuse anyone; it is clearly a BMW sedan. The car has grown—again—but is lighter than its predecessor. But the real key is the renewed emphasis on the driving experience. Dynamics are sharp and the car is said to be fun to drive. All-in-all, the new 3 flatters the driver. Rear drive remains the default but all-wheel-drive will be offered across the Series. Autonomous tech is built in but the car is meant to be driven. As with all modern BMWs, the model number isn’t a reflection of displacement; it is power and torque that set the hierarchy of model names. The 330i gets the familiar 2.0-liter inline four-cylinder with 255 horsepower now and torque peaking at 295 lb-ft. That’s in increase of seven horsepower and 37 lb-ft, compared to the 2018 predecessor. A twin-scroll turbocharger continues to be used. Zero to 60 mph comes in 5.6 seconds. Not so long ago that was supercar time. And this is the base 330i Sedan. At or soon after introduction, there will also be two M Performance models offered, the M340i and M340i xDrive. These two get the inline six-cylinder engine with 382 horsepower and 369 lb.-ft of torque. Zero to sixty is 4.2 seconds for the M Performance twins. M Performance models will get chassis tuning, an M Sport rear differential and should make it tough on the M engineers who will have to surpass these numbers with the new M3 version. We won’t see that before 2020. An iPerformance model with the latest plug-in hybrid drive will be available soon after launch. The only transmission offered is the eight-speed automatic with paddle shifters. The rumor is that there will be a manual option for the M3 (codenamed G80). The other rumor is that the M3 will be offered with sDrive (rear-drive) as standard and xDrive (all-wheel-drive) as an option. Don’t expect the M3 to be offered until the 2020 model year. However, the M340i and M340i xDrive have already been announced. This seems to be the new pattern with the M Performance cars coming out with the base models, followed by the full-on M Cars later. The press release says that lift-related dampers have main and auxiliary springs and internal hydraulic bump stops. The latter allow for progressively increasing pressure inside the shock. I guess this is a new technology and a BMW first. The result is a passive (rather than adaptive) shock but with substantial improvements in vehicle dynamics. Simpler and better is good. Other items of note related to the chassis, or perhaps we should say unibody. Weight has been reduced by 121 pounds despite the new car being larger. More aluminum parts are used. The drag coefficient is an astonishing 0.26. Beauty is in the eye of the beholder, of course, but this is a good-looking car. I suspect it may be criticized for being a bit timid in the evolution from the previous model. It does have to last for seven years with nothing more than a refresh of the lights in about three years. The interior styling will be familiar to any BMW owner. The instruments directly in front of the driver are very similar to the 5 and 8 Series. Generally, the dash has been simplified a bit and the materials have been upgraded a notch. 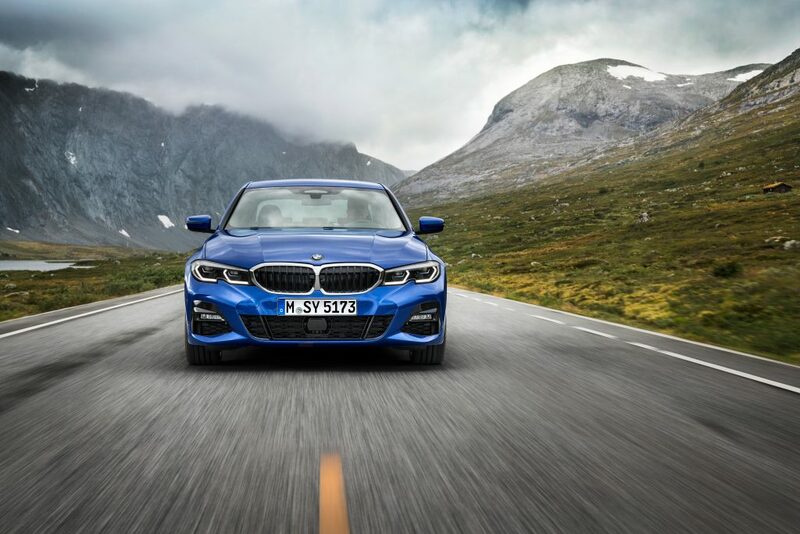 The new 3 Series will be loaded with electronics including lane departure warning, Active Cruise Control, Active Guard Collision, Pedestrian Warning with City Braking function and, finally, Blind Spot Detection. Just like a Toyota Camry. BMW is very proud to introduce the BMW Intelligent Personal Assistant, which responds to the prompt, “Hey BMW.” Your BMW version of Siri or Alexa will learn your routines and habits, and is subsequently able to apply them in the appropriate context. You’ll be able to say, “Hey BMW, I’m cold” and the car will adjust the temperature to your preferred temperature. I hope it works better than the voice activation in my M2, where the nav system always wants to take me to New York. Usually I just get frustrated and use my phone. You’ll also be able to ask your BMW Intelligent Personal Assistant about the vehicle (How is the oil level?) or to explain the vehicle’s systems. The press release always refers to the BMW Intelligent Personal Assistant as a male. I don’t know whether this can be changed. I can’t wait to see how the 2019 Personal Assistant sounds in 2029; probably like having a 286 computer embedded in the dash. 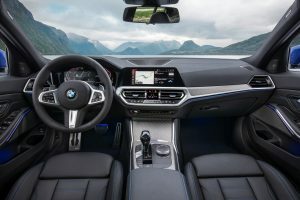 By the way, the standard system for the BMW Live Cockpit is iDrive 6.0. But you can upgrade to a bigger screen and iDrive 7.0. I gotta tell ya, my 2017 M2 has iDrive 7.0 and feels about five years behind my wife’s 2018 Kia. BMW, there ought to be joint venture where you could get some help in this area. Or, better yet, just let us run our phones through the in-dash monitor, like Apple CarPlay or Android Auto. I have a feeling the new 3 Series will be bought by millions in spite of the electronic interface. The 2019 330i arrives with a base price of $40,250 plus $995 destination charge. The 330 xDrive Sedan will start at $42,250 plus $995 destination. 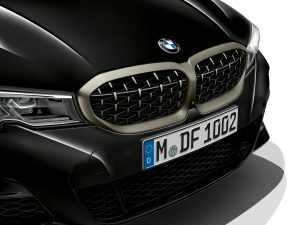 Pricing for the M Performance models has not been announced.